In the United States, capital markets satisfy 70% of the external financing needs of businesses, according to the International Regulatory Strategy Group. In the EU, the International Monetary Fund (IMF) says that over half of external funding comes from bank loans. While there have been big moves in continental Europe in the direction of establishing liquid and efficient markets for corporate bonds, commercial banks still continue to provide the lion’s share of new financing in direct loans to firms that need them. It is for this reason that analysts typically look at how well Europe’s banks are performing as an indicator of the health of the region’s wider economy. Share prices in European banks that fall significantly tend to reflect concerns over the quality of the affected banks’ books of loans, as these can feed into poor earnings performance. If banks build a book of bad investments, known as ‘non-performing loans’, they can put equity capital at risk if such investments need to be written off their balance sheets. If banks are essentially underwriting whole national economies – as they do in the euro area – we can glean some insight into the performance of the latter by assessing the state of the former. Figure 1 shows how European banks have underperformed US banks and the MSCI World Bank Index. 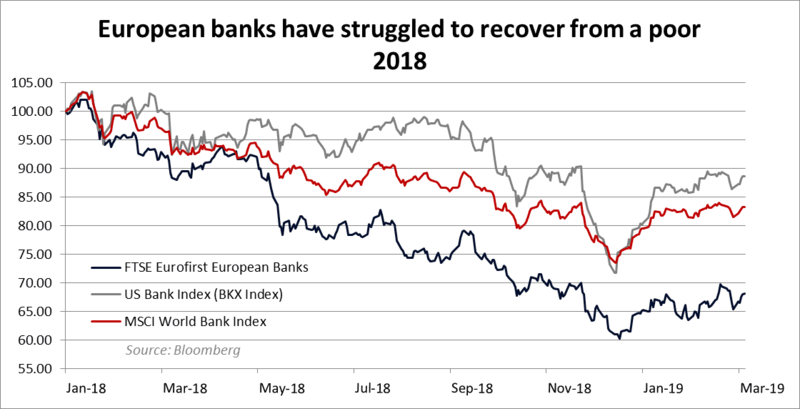 European banks are down about a third from the start of 2018, compared to 15-20% in the US. 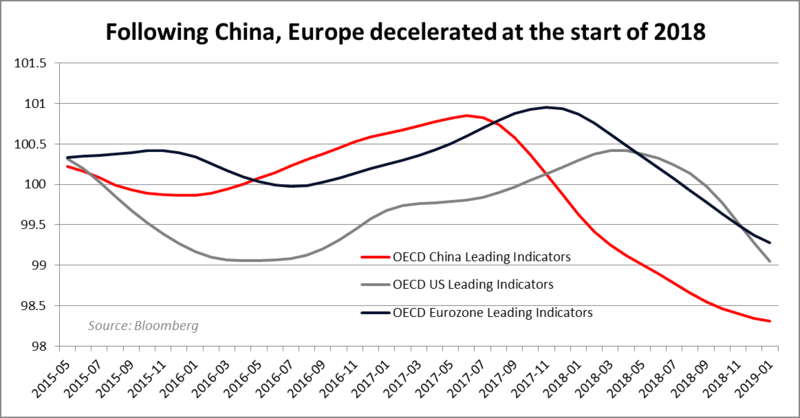 This trend arguably mirrors the significant pullback in European economic performance as measured by the OECD’s leading indicator indices for key global regions in Figure 2. Figure 1: All bank stock indices are weighted to 100 in January 2018 and performance is relative to then. The era of low interest rates has created a challenging environment for global banks to meet their earnings targets, but there has been a narrative for some time that European banks in particular have struggled with high levels of non-performing loans that they accumulated during the late 2000s and early 2010s. According to the European Banking Authority, Italy holds a stock of some €160bn in non-performing loans (NPLs), amounting to close to 10% of all loans outstanding. Across the euro area, while the average ratio of NPLs has fallen from 6.4% in December 2014 to 3.6% in June 2018, this is partly due to an increase in new loans in recent years on the back of monetary stimulus from the European Central Bank. It may take some time before these latest loans turn sour if they are to do so. Figure 2: Leading indicators include items such as consumer and producer confidence indices, industrial production and new orders, share prices, new housing starts and interest rate spreads. World Bank analysis puts non-performing loans in the United States and Japan at much lower levels, closer to 1%. By contrast, in October 2018 a study from the European Parliament revealed that NPL ratios were 4.2% in Spain, 12.4% in Portugal and 7.0% in Ireland, well above levels in Germany (1.7%). European banks deal intensively across borders, with many German and French banks exposed to debt in the European periphery, so the risks are pan-continental. Italy is a problem case and has created headaches for bureaucrats at the ECB. In 2015, the IMF published an alarming paper that found that parts of southern Italy had NPL ratios as high as 40% while Italian banks had cover (or provisioning) for only about half of the bad loans on their books. The ECB is demanding that Italian banks increase their provisioning to 100% over a seven-year period, which promises to squeeze profitability and the return on equity for banks’ shareholders. But there is a wider issue. Last week, the ECB announced a new round of targeted long-term refinancing operations (TLTRO) stimulus in an attempt to arrest the marked slowdown in the Eurozone economy in the last year. TLTROs enable banks to get funding at negative interest rates from the central bank on the condition that they then lend funds on to the real economy. However, the issue is not really that banks need funding to encourage them to lend. Banks have already boosted lending on the back of previous rounds of TLTROs, which amounted to €724bn, over half of which has been taken up by Italian and Spanish banks. Rolling over maturing TLTRO loans from 2016 might help banks maintain their levels of stable funding but there is no need for new bank reserves for further lending. The core problem is that banks struggle to find enough good projects that they can lend to at attractive interest rates without incurring undue risk, and this is a question of economic performance and policy. The clue lies in the fact that banks had needed to be paid to lend to the real economy in the first place; the lending rate on TLTROs is -0.4%. Figures 3 and 4 show what has gone wrong. Between 1996 and 2007, in inflation-adjusted terms, productivity in the euro area grew on average by 1.25% annually. After the financial crisis that rate of growth has fallen to 0.75% per annum. If one is looking for a general reason why European banks are struggling, one can find it here. As productivity growth has slowed, firms (typically small and medium-sized) have found it tougher to grow their earnings, and those with leverage have struggled to make good on their loans. With banks looking to reduce their risk exposure, there is a limit on how many new loans they are willing to make to firms in an environment in which productivity growth is so weak. Figure 3: The chart shows the annual real productivity growth in output per hour for euro area members at the time of measurement. 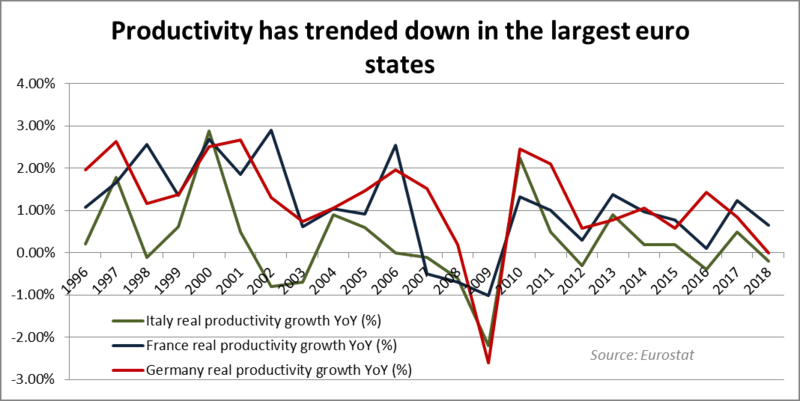 Figure 4: Real productivity growth in output per head as trended down in all three major euro area economies. And this is a failure of policy because the government is responsible for maintaining an adequate level of total demand in the economy. If there is too little total demand, there will be idle resources and productivity – a ratio of output to input – will logically be weak. The EU institutions have promoted a regime of fiscal restraint and ‘structural reforms’ that would in theory boost productivity and raise competitiveness. This hasn’t really happened. An ageing society was always going to lead to slower economic and productivity growth as baby boomers retire and the rate of innovation falls, but these do not explain the entire step-down in productivity developments in the last 20 years in Europe. Instead it seems that policymakers have preferred to explain away persistently high rates of unemployment – particularly in Spain, Greece and Italy – as ‘structural’ or normal. This means that they are less likely to diagnose their economies as having deficient total demand meriting higher public spending. For sustainable growth to return to Europe, the continent does not need more monetary policy measures such as TLTROs that simply push on a string. There needs to serious fiscal stimulus – led by Germany – that raises the inflation rate so that indebted countries such as Italy and Portugal can participate too. Figure 5 shows how Germany has a huge capacity to increase spending. Since 2012, the rate of growth in nominal GDP (which measures growth in real output plus inflation) has significantly outstripped the yield of 10-year Bunds. Since tax revenues grow organically at the same rate as nominal GDP – assuming no changes in tax rates – this situation means that Germany has been able to cover its public debt levels comfortably. Figure 5: The sustainability of public debts relies on the ratio of nominal public debt to nominal GDP – i.e., with no inflation adjustment. If the nominal interest rate or yield that applies to public debt is lower than the growth rate of nominal GDP then the ratio falls. This creates fiscal space for the country to increase deficit spending. For Italy, the situation is tougher. Figure 6 shows that risk-free interest rates on Italian public debt (BTPs) are currently higher than the rate of nominal GDP growth. This means that deficit spending would not necessarily be self-funding. 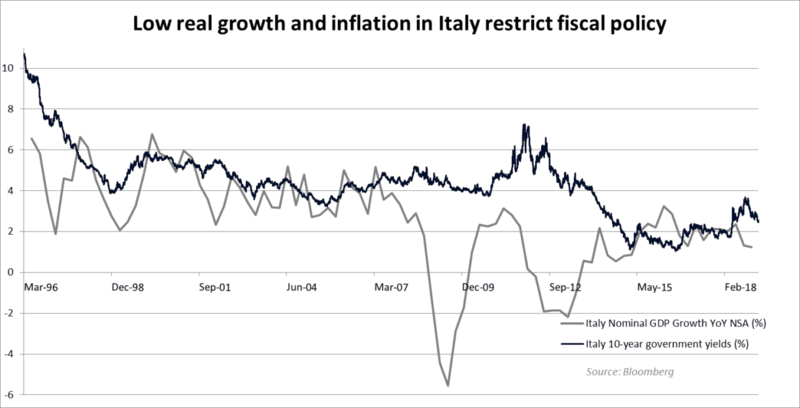 Italy would have more fiscal space if there were an environment of higher inflation and real growth, and deficit spending itself can deliver these. But the problem is that Italy already has an extremely high debt-to-GDP ratio and the European Commission is nervous about allowing the Italians to spend more. Figure 6: Italy could raise its debt sustainably by simply increasing its rate of inflation and keeping it above the yield on government debt. This would reduce the real value of its outstanding stock of bonds and present capital risk to bond holders, but it would allow the state to spend more. However, the impasse cannot last. The pressure on policymakers to stimulate effectively is likely to grow and as we think that as fiscal policy is the only game in town, we are likely to see measures – possibly even at the European level – to permit increased spending over the next couple of years. A programme targeted at both public investments and raising consumers’ income through tax cuts could be the spur that crowds-in private investments, encourages bank lending and boosts productivity. From an investor’s point of view, however, there are clear risks. While the purpose of fiscal stimulus is to raise the growth rate of the economy, which may feed through into higher earnings yields and returns on investments, there would likely be risks to certain investments in the short term. Fiscal spending would likely raise the rate of inflation, which could lead to a fall in the capital value of fixed income products such as government bonds. If the central bank responds by raising interest rates, the loss on these products could be compounded. An environment of fiscal stimulus is arguably likely to favour equities – which tend to have greater inflation protection – over bonds. Weak banks in Europe are revealing a weak European economy. A recovery in China could keep Europe buoyant but it wouldn’t address the region’s underlying problem: that of low productivity and deficient demand. With monetary policy a spent force, the region needs fiscal stimulus and when policymakers realise there is no alternative, it is likely to get it. 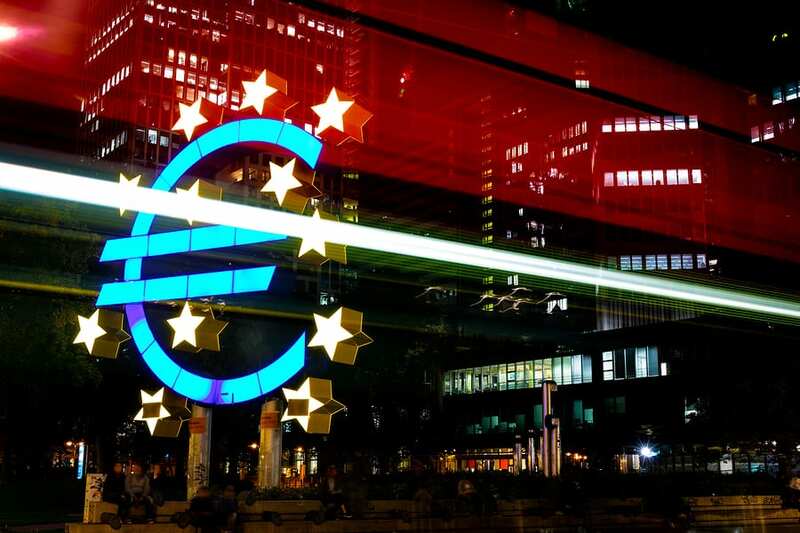 Until it does, however, the euro area could find itself returning to the slow lane.